South Adelaide have suffered 55-point loss at the hands of Glenelg at Gliderol Stadium on Saturday afternoon. The Panthers were punished for their poor efficiency, both around the ground and in front of goals, by a methodical and accurate Glenelg side, falling to a 5.18 (48) to 16.7 (103) defeat. The Bays were able to capitalise on several South Adelaide errors by hand and foot and apply scoreboard pressure early, taking a 22-point lead into the first change and never looking back. Meanwhile, despite leading the inside 50 count 59-43 for the match, enjoying much of the play in their forward half and finishing with the same amount of scoring shots, the Panthers inaccuracy in front of goals kept them from punishing the Tigers on the scoreboard. In direct contrast, Glenelg's leading forwards Terry Milera and Liam McBean kicked 10 goals straight between them, with the former St Kilda speedster contributing six and the former Richmond tall four. South Adelaide's forward line, already missing the presence of Sam Overall was dealt another blow early, with fellow tall forward Ben Haren forced from the ground with a shin injury. 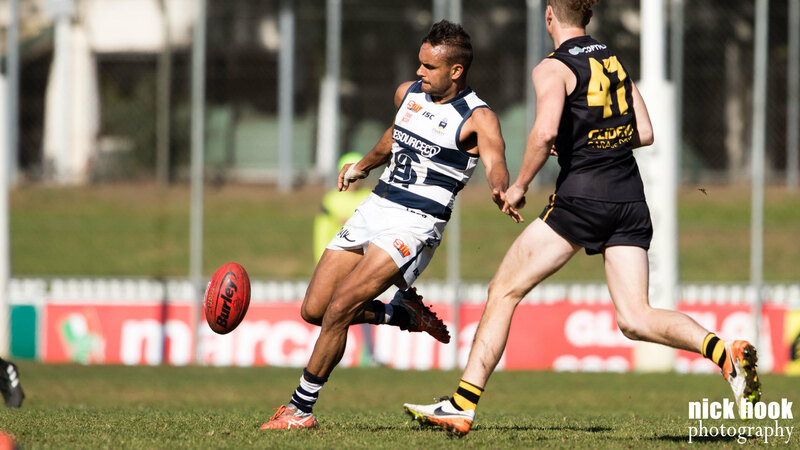 In their absence Abe Davis provided the Panthers primary target in attack, with the former Sydney Swans Rookie kicking a team-high three majors. However, the Panthers yips in front of goals was widespread throughout the team, with 11 players hitting the scoreboard, but only three registering a major score. On a positive note, South welcomed their eighth debutant to the fold during the game, with American ruckman Alex Aurrichio taking to the field against the Tigers and putting in a competitive display with 32 hit outs around the ground. Vice captain Matt Rose was best afield for the Panthers, gathering 26 possessions, laying seven tackles and clunking seven marks. Likewise, Nick Liddle (team-high 28 touches and six tackles) again didn't have his colours lowered despite the result not falling his sides way and fellow onballer Xavier Gotch (24 disposals) was also a key mover in the Panthers midfield. Up forward the aforementioned Davis (13 possessions and three goals) and second-gamer Cody Szust (17 touches and a goal) were lively, but could have been more damaging, kicking six behinds between them. Best for the home side was the prolific Milera (20 possessions and six goals) and ruckman Warrick McGinty (24 touches, seven marks, 29 hit outs and six clearances). 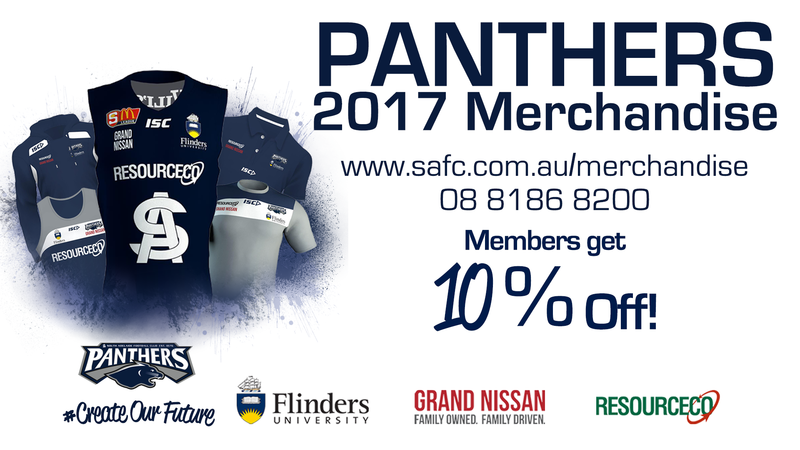 The Panthers now look to bounce back next weekend as they clash with West Adelaide from 2:10pm, Saturday, July 22 at Hickinbotham Oval. South Adelaide's Reserves have rejoined the winner's list with a dominant 65-point victory over Glenelg at Gliderol Stadium on Saturday afternoon. The Panthers shrugged off a sluggish start and rode a blistering second quarter to set up a 19.11 (125) to 8.12 (60) victory over the Tigers. Glenelg enjoyed the momentum early, setting up a 21-point buffer at the first change. However, South Adelaide enjoyed a dominant second quarter, outscoring the home side 8.3 to 0.2 and establishing a 28-point lead at halftime. The visitors outscored the Tigers 18.11 to 4.9 over the final three quarters to equal their biggest winning margin of the season. Peter Rolfe was in outstanding touch, racking up 28 possessions and nine clearances, while also booting three goals and setting up four more. Ruckman/forward Codey Ellison showcased his athleticism around the ground, amassing 37 hit outs, while Rigby Barnes (28 disposals and nine marks) found plenty of the footy. Tyson Brown (20 touches, nine marks and six rebound 50s) continued his strong run of form, while new comer Mark Noble impressed on debut with 27 touches, eight marks and eight inside 50s and Bryce Damin put in a typically competitive performance.. The Reserves are next in action against West Adelaide from 11:30am, Saturday, July 22 at Hickinbotham Oval.